Actor classes are implemented by extending the Actor class and implementing the receive method. The receive method should define a series of case statements (which has the type PartialFunction[Any, Unit]) that defines which messages your Actor can handle, using standard Scala pattern matching, along with the implementation of how the messages should be processed. The last line shows a possibility to pass constructor arguments regardless of the context it is being used in. The presence of a matching constructor is verified during construction of the Props object, resulting in an IllegalArgumentEception if no or multiple matching constructors are found. The lifecycle of an incarnation ends when the actor is stopped. At that point the appropriate lifecycle events are called and watching actors are notified of the termination. 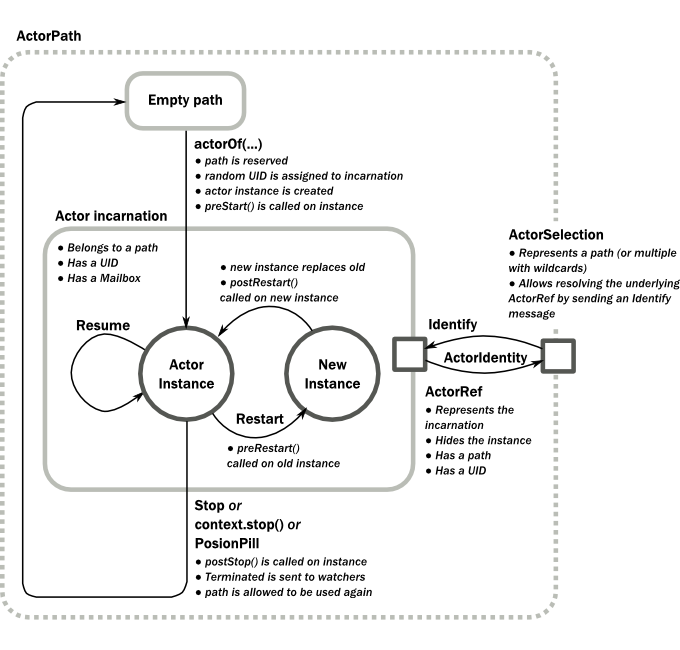 After the incarnation is stopped, the path can be reused again by creating an actor with actorOf(). In this case the name of the new incarnation will be the same as the previous one but the UIDs will differ. actorFor is deprecated in favor of actorSelection because actor references acquired with actorFor behaves different for local and remote actors. In the case of a local actor reference, the named actor needs to exist before the lookup, or else the acquired reference will be an EmptyLocalActorRef. This will be true even if an actor with that exact path is created after acquiring the actor reference. For remote actor references acquired with actorFor the behaviour is different and sending messages to such a reference will under the hood look up the actor by path on the remote system for every message send. The onComplete, onSuccess, or onFailure methods of the Future can be used to register a callback to get a notification when the Future completes. Gives you a way to avoid blocking. Actors are stopped by invoking the stop method of a ActorRefFactory, i.e. ActorContext or ActorSystem. Typically the context is used for stopping child actors and the system for stopping top level actors. The actual termination of the actor is performed asynchronously, i.e. stop may return before the actor is stopped. Upon ActorSystem.shutdown, the system guardian actors will be stopped, and the aforementioned process will ensure proper termination of the whole system. The method preStart() of an actor is only called once directly during the initialization of the first instance, that is, at creation of its ActorRef. In the case of restarts, preStart() is called from postRestart(), therefore if not overridden, preStart() is called on every incarnation. However, overriding postRestart() one can disable this behavior, and ensure that there is only one call to preStart().